Last year, Labour MP Lloyd Russell-Moyle visited Rojava to learn about its radical democratic ‘revolution’. He argues that support for the Kurdish cause is now more important than ever. In the 2017 general election, Lloyd Russell-Moyle took his Brighton Kemptown seat from the Tories on a swing of nearly 20 per cent. In the year-and-a-half since, he has grown rapidly in prominence. In November 2018, he became the first MP to announce in the House of Commons that he is HIV positive. Soon after, he picked up the ceremonial mace during a particularly anarchic Brexit debate, an act which resulted in a day-long suspension from the House of Commons. Before parliament Russell-Moyle was a longstanding local left-winger and anti-war activist. So it’s maybe no surprise he took the time last year to visit Kurdistan on a solidarity delegation to both Rojava, the Kurdish breakaway region of northern Syria which has gained attention in recent years for its experiments in radical democracy and resistance to Islamic State, and the Kurdish region of Iraq which held a disputed independence referendum in 2017. The delegation of which he was part, organised by Unite the Union and the Centre for Kurdish Progress, was a milestone in the growing relationship between the British labour movement and the Kurdish cause. Both of the last two Trades Union Congress (TUC) have carried motions of support for Kurdish self-determination, and the theme of last year’s Durham Miners’ Gala was freedom for imprisoned Kurdistan Workers’ Party (PKK) leader Abdullah Öcalan. Tribune’s associate editor Marcus Barnett sat down with Lloyd Russell-Moyle to discuss his experiences of Kurdistan, his impressions of the changes brought by what’s known as the Rojava Revolution, and his fears for its vulnerability to Turkish aggression in the wake of likely American withdrawal. There haven’t been many British politicians visiting Kurdistan since the start of the civil war in Syria. What were the main reasons for your visit? There were two reasons for the trip. We wanted to look at northern Iraq past the 2017 Kurdish independence referendum, where the Iraqi authorities had clamped down on the demonstration. My impression was that they had clamped down just like the Spanish authorities [had clamped down] over the Catalan independence referendum, and in the same way every state clamps down on any democratic credence or talk of independence. So, we wanted to go and see the aftermath. But we also wanted to go across the border to see this new corridor that has opened up in the north between Erbil and northern Syria. The Kurds had effectively destroyed ISIS in the areas they held – the Democratic Federation of Northern Syria (DFNS), now broadly known as Rojava – and we went, as some of the first Labour representatives, to go and investigate their society. We spoke to the cross-ethnic, cross-party government there, about what they had done to not only fight ISIS, but to start rebuilding the area, and to establish a society that was based on social democratic, or democratic socialist – whatever you want to call it – principles. We were taking into consideration the advances around gender representation and ethnic minority representation, their enthusiasm for rebuilding Afrin – of course, Afrin was one of the cities captured from ISIS that they had started to rebuild, before Turkey invaded and caused huge disruption. So, we wanted to talk about this. We visited Kobane, which was one of the first cities that hit the headlines because of ISIS attacks. These were important things to go and see, as was seeing the structural and moral rebuilding after this pivotal moment. You were there while Turkish forces were invading Afrin? Yes. They had basically wrapped up their invasion by this point and were in the process of implementing extremist Islamist rulers in the area. From our understanding, this was who Turkey was placing back in Afrin. We wanted to talk to people and work out how to support their fight. If there is any solution on the ground in Syria, it needs to be less focused on grand political bargaining, and more around building ceasefires and stability on the ground – and then working out the political situation afterwards. We should learn lessons from Yugoslavia, where there is some settled peace. A northern federation could be an example. You don’t worry about who is in charge per se, you work out how the fighting can finish. From our discussions, we understood that the DFNS was keen on remaining part of a wider Syria, and they dream of their forces – the YPG-YPJ (People’s Protection Units) – absorbing into a Syrian confederal force. They want a meaningful inclusion in a democratic, confederalist state. You mention that Kobane was a morally and strategically crucial moment for anti-ISIS forces. At the time people were comparing it to the sieges of Stalingrad or Leningrad. Would it be fair to say that Afrin has played out in the opposite direction, deeply demoralising the fight for Kurdish self-determination? To sum it up shortly – they believe that Erdoğan and the Turkish forces are fascist. If they are slightly exaggerating, then they are not far wrong. The view broadly held is that, while they can win the hearts and minds of citizens on the ground, and they can win democracy in the municipalities, democracy has no air force and fascism does. If they stop the planes in the sky, the YPG claim, they can push back into Afrin tomorrow. This may be foolish, but this is what many believe. It is similar to the dilemma of the Republican forces in the Spanish Civil War. With no planes, with no aerial cover, what can they do? You can win all the land, all the hearts and minds, but the problem is that a state military does have those resources and it will win the air war – which, nowadays, effectively means winning the war. So, there are difficult conclusions to come from that – about Labour’s policy, and about my thinking. Broadly speaking, I am always anti-intervention, and I am against all international military involvement – but the experience put into my mind that we need to make some sort of no-fly zone. How you get there, without blowing up a Russian plane and starting World War Three, is the challenge. But the outcome must be something along those lines. Without it, Turkey will just march through, and they will lose everything. If you lose your land, and that land is forcibly repopulated, how can you build again? American withdrawal should not be welcomed if it means handing over the keys to a tyrant in Turkey who has killed and locked up hundreds of Kurds, and had more academics, members of parliament and judges imprisoned than any other country in the world. Turkey remains one of the biggest threats to Rojava and, after what we saw in Afrin, the United States could be complicit in a massacre if it gives them a free pass. The Kurds need to be given space to negotiate a peace deal, not subject to threats by the United States of turning the region over to Turkey. Lloyd Russell-Moyle MP visited Kurdistan last year as part of a delegation organised by Unite the union. What sort of people did you speak to? We spoke to lots of people who were ostensibly “nobody”, but who were the most important building blocks to a new society – the masses of local people. We spoke to the low-level officials elected to the local councils. At first, they started by going to door-to-door, establishing councils built on principles from higher-up. One of those principles was gender equality, one was ethnic diversity – the rule that no ethnic group can hold more than 50% of the seats. If there is more than 50% of that ethnic group in that area, there must be representatives of other minorities as well. In those committees, representatives deal with health, civil defence, education, women’s rights, and so on. That approach to building communities together, street by street, road by road means that these communities are very resilient, even if they aren’t getting huge amounts of resources for health or education. They were functioning. You have village halls where people gather, have discussions, conduct elections. Every month, there is a big assembly of all the people. There is also an annual assembly where people have the right to dismiss or recall officials that they are unhappy with. The idea is that this is where localist principles are enshrined in practice. There is a level of day-to-day gender equality that we have never seen in the British parliament. We met the co-leaders of the Rojava area, and particularly tried to meet with those dealing with the humanitarian crisis and internally displaced people in Afrin. How is the refugee situation there? Did you witness much of the reconstruction of Kobane? People just got cement and started rebuilding, all-hands-on-deck. The people are rebuilding Kobane – everything was destroyed, but they are building it pretty quickly. What has happened is that internally displaced people from Afrin have been placed in other people’s house – as much as the councils can manage, they are not in refugee tents, but they are being housed by families. To some extent, this happened the other way around, when Kobane was being flattened in 2014. They fled and returned. 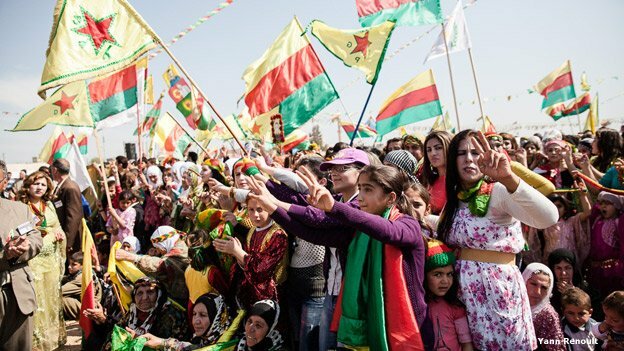 Does Kobane and its resistance still resonate? Oh yes. In Kobane, there is the huge statue of the Angel – a young woman who, the story goes, came and turned the battle around. There is a hope that this will happen again. I wonder if this hope is somewhat misplaced, as the forces of geopolitics are working against them. The Turks are rolling in and there is nobody there to give them protection, there’s not a lot you can do. I understand that they do not want to be under Assad, but I don’t know what the other choices would have been. Among ISIS fighters, there is an annihilationist outlook with regards to the Kurdish population. How do they respond to that? Exactly. The analogy that Lord Glasman offered is the Stalin-Hitler Pact in 1939: the Kurds need to work out which force wants their actual destruction immediately, and which one maybe wants their longer-term destruction. The one that wants their immediate destruction they need to fight against now, and the one that wants their longer-term destruction they need to ally with, and then work that out in the longer term. That’s probably what they need to do, but I wonder if it is too late. Britain can still influence Turkey quite a lot, but I am not sure if our government is willing to. We shall see. As it currently stands, Labour’s international team has been articulating a more progressive foreign policy than the party has seen in decades. However, as a party we have been relatively quiet on the situation in Rojava. Do you think that there is any way we can more meaningfully engage with it? I agree, but we’ve not ran away from it either. The situation requires careful handling. As a Labour Party, we should accept that our intervention should look less like war-making and more like peace-keeping. The situation may involve peace corridors or United Nations blue helmets. It could be a no-fly zone. The Party agrees that all these things are on the table – and that the Kurds of Rojava must have a detailed role in that settlement. We have to understand that when peace comes, it will not sweep everything under the carpet. Some reckoning of what people have done on all sides is necessary. I don’t think we should assume that the Kurds are angels – I’m sure many have done nasty things in the battle against ISIS, but that’s what happens in times of emergency. In the immediate, when I came back, I contacted [Labour MP] Stephen Twigg, who was in Washington at the time, and I asked him to contact the Global Partnership for Education, which gives education money for primary school education. It only gives it out to states, not non-state actors. He met with Madeleine Albright, and she has agreed to look into supplying education funds to occupied areas where money could be given safely. Hopefully, we’ll get some movement on that, and more progress from a humanitarian angle soon. Because of the intervention of Labour – not this government – we might see some progress for Rojava. Would I be right in saying Anna Campbell, a resident of your constituency, died fighting in Afrin? There are also Young Labour members fighting alongside the Kurds in various sections of the YPG. What were the attitudes towards the outside world in Rojava? Anna was actually a resident of the next-door constituency, Lewes, but she went to college in Brighton. I bumped into her dad last week. There are a lot of people out there. It’s a very similar position to the International Brigades – and there is a real worry of a similar outcome. Here, there is a very serious point to made – it is a point that I think the Labour Party are pushing forward. If Turkey is using our weapons to effectively kill British citizens, we have to really question if they are an ally of ours. This isn’t collateral damage, or ‘oops – we didn’t realise’, Turkish forces are targeting British people defending the Kurdish population. We have to also be very clear that these people are not terrorists. In my city, the police have placed the YPG and YPJ on the Prevent list, in the same bracket as ISIS. We could potentially take a leaf from the Belgian courts several months ago, who declared that there are no legal definitions of the YPG and YPJ as terrorist organisations, only what is extrapolated from perceived links to the PKK. We have to be clear – if people are volunteering to defeat a force that poses an existential threat to humanity and are helping to build a democratic socialist state, they must not be compared to ISIS. Lloyd Russell-Moyle is the Labour Co-operative member of parliament for Brighton Kemptown.